Stockit can be used with many Schematic and PCB design products in the market but has close ties with the Easy-PC product from Number One Systems and the Pulsonix PCB design product. With Pulsonix, the integration is taken a step further with access to the Stockit database directly linked via an ODBC connection. This means stock attribute fields can be accessed and displayed in the Pulsonix Database Connection (PDC) option using its powerful parametric search capabilities. Once the relevant Part has been located, it can be added into a Pulsonix design along with its attribute properties. With the ability to mark attribute fields as critical, design rules checking ensure that Parts used are always correct and up to date based on your live stock situation. 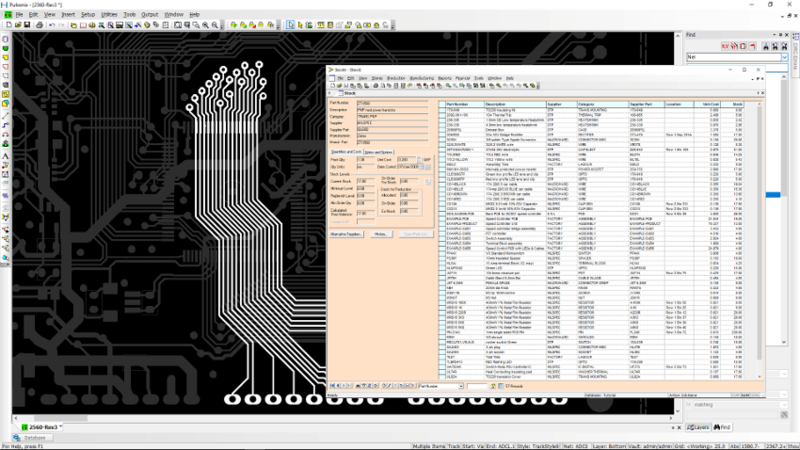 The interface between your PCB EDA (or Schematic) product is a Parts List written as a simple CSV file. The format of the Parts List is pre-defined but is a non-complex format of generic design information such as Quantity, Part Number, Description and Component Number. All other required fields are extracted from the Stock table. During import, the Parts List is read by Stockit using its standard Parts list import facility. This will create any stock items for any parts listed in the Parts List that do not already exist in the Stockit Stock table. The stock items created will be basic entries with many of the fields, such as supplier, left blank. From within Stockit, the Stock table can be exported in CSV format, this can be used as a starting point for your Parts data in the PCB system. It also means that as new Parts are added to Stockit, the Parts can be updated for use in your designs and stock of Parts can always be kept current. Parts that exist in your PCB design system can be exported in Stockit CSV format and imported directly into the Stock table. It may be that the electronics designer is driving the purchasing cycle by using specific manufacturer’s devices. A mix of specifically required, and generic unspecified parts can be used by making use of the flexibility of Stockit. Pulsonix can be integrated with the Stockit database using the Pulsonix Database Connection (PDC) option. Stockit provides a database that contains all your component stock information and inventory. This includes Part attributes that can be used by both Stockit and Pulsonix. These attributes can be accessed using parametric searching criteria in Pulsonix. Once the appropriate device is located, it can then be added to your Pulsonix design as either a Schematic Symbol or PCB footprint. The Stockit database can be populated with Attributes that can be loaded into Pulsonix along with the Part to add more complete manufacturers information, such as an internal Bin Number, Manufacturers Part Number, MFR, Value, Tolerance, Wattage, MTBF, Obsolescence etc. All your Part Attribute information is stored centrally and not on the Part Library definition in Pulsonix. This means Stockit controls and manages all aspects of your stock using user-defined Attributes. This could include purchase options, delivery, obsolescence, supplier/part preferences, lead times and costs, plus many more critical aspects. The attributes passed to Pulsonix can be defined so that a refined set is passed through. It also means key and critical Attributes can be defined. The advantage is that all your Parts stock and Parts lists, along with all the added features of Stockit’s kitting and management system are contained in one central repository. The Pulsonix Database Connection (PDC) is required to provide Pulsonix the transport mechanism (using ODBC) to connect to the Stockit database. It also provides the enhanced parametric searching. Once the design has been populated with Parts, Design Rules checks in Pulsonix can made between the design and the Stockit database. Advanced checks are made using fields marked as ‘Critical’. These fields are defined when setting up the mapping of attributes between Pulsonix and Stockit. Advanced checking enables Stockit attribute field status to be changed and the changes checked in Pulsonix. Once the checks have been completed and verified, updated Parts data can be download to the design to ensure your design is always up to date. The checking also allows you to highlight results reported using selected criteria, such is the power and flexibility of this system. Using intelligent Stockit Attribute fields, such as an Obsolescence flag, by changing the attribute field in Stockit, the Pulsonix design can be checked against that field and a warning/error raised if it is different. This can be Obsolescence=N (not obsolete, or whatever, available to use) but then in Stockit it is set to Y (yes, now obsolete, do not use). A DRC check against ‘the database’ will flag a change in status against the master. Once a PCB design has been verified and finalised, a Stockit Parts list can be exported from Pulsonix. This is read into Stockit, added and processed as a Parts List in the Stockit environment ready for production.